The Top Grossing Holiday Film Of All Time Is? 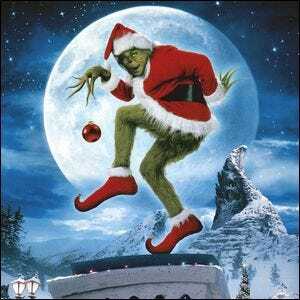 In the winter of 2000, the Grinch didn’t just steal Christmas, he stole the box office along with it. The live-action adaptation of the popular 1957 Dr. Seuss children’s book How the Grinch Stole Christmas was theatrically promoted with the title The Grinch. Despite the fact that the movie was panned by critics and scored poorly on movie ranking sites, it was wildly popular with movie-goers. It opened number one across the United States, grossing $55 million over the first weekend. Not only did it do well on release, but it ran in theaters until April of the next year, pulling in another $205 million in domestic gross. When it finally ended a worldwide run, the total gross for the movie was $345 million, putting it solidly (and without even a close rival) as the number one top grossing holiday film of all time. Image courtesy of Universal Pictures.